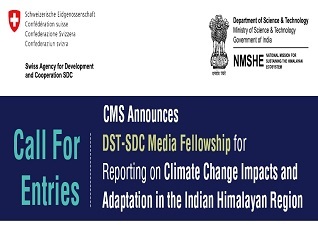 The Indian Himalayas Climate Adaptation Programme (IHCAP), a project of the Swiss Agency for Development and Cooperation (SDC) in partnership with the Department of Science and Technology (DST), Government of India and the Centre for Media Studies (CMS) invite environment journalists to apply for a three-month Fellowship to report in depth about climate change impacts on Himalayan communities and how they are responding and coping with the impacts. The Fellowship is open to journalists working in print, electronic and digital media. A two day ‘Consultation Workshop of States of the Himalayan Region 2016 under NMSHE and Launch of IHCAP Phase 2’ organized jointly by the Department of Science and Technology, Government of India and Indian Himalayas Climate Adaptation Programme (IHCAP) of the Swiss Agency for Development and Cooperation (SDC) on 10th and 11th March, 2016 in New Delhi. Representatives from Himalayan States, several ministries of Government of India, officials of DST and SDC, senior scientists, experts and academicians working on varied areas of Himalayan ecosystem, climate change experts, civil society organisations and various bilateral and multilateral agencies participated in the workshop. A three-day workshop to sensitize journalists on adaptation to climate change in the Indian Himalayan Region was organized by the Centre for Environment Education Himalaya and Thethirdpole.net as part of the Indian Himalayas Climate Adaptation Programme (IHCAP) of the Swiss Agency for Development and Cooperation (SDC) in Jorhat and Majuli, Assam from 2 to 5 November 2015. 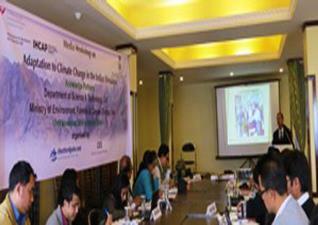 A workshop to sensitize journalists on climate change issues in the eastern Himalayan Region of India was organized in Namchi, Sikkim from 17 to 20 November 2014. The workshop provided participants an opportunity to learn more about the existing policies of the state governments on climate change mitigation and adaptation; and interact with experts on climate change and government officials. This workshop was second in a series of four capacity building workshops for the media, organized jointly by the Centre for Environment Education Himalaya and thethirdpole.net as part of the Indian Himalayas Climate Adaptation Programme of the Swiss Agency for Development and Cooperation. 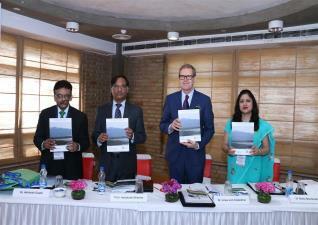 The workshop was organized to launch the Task Force on Himalayan Agriculture under the National Mission on Sustaining Himalayan Ecosystems (NMSHE), supported by the Department of Science & Technology (DST), New Delhi. Dr. S. Ayyappan, Secretary, DARE and Director General, ICAR launched the Task Force and emphasized that the Task Force should have a multidisciplinary team, which is also the strength of ICAR and to have concerted efforts to work in select locations to make the impact visible. He also acknowledged the support of the DST for this important activity as part of the 8 National Action Plan for Climate Change. Further, Dr. Ayyappan indicated `Practices, Products and Policies’ as part of the process of implementation and monitoring to enable sustainable livelihoods for the farmers through action research and technology demonstrations. 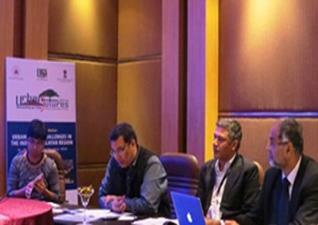 A group of decision makers, research scientists, academicians, government officials, representatives from the civil society came together on 5 October, in Guwahati to share knowledge and exchange ideas related to disaster risk reduction, tourism and environmental governance and to prioritize actions for climate change adaptation in the Indian Himalayan Region. 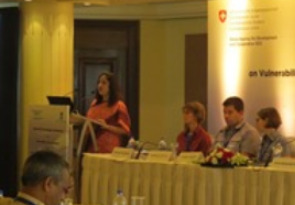 The workshop was organized by the Indian Himalayas Climate Adaptation Programme (IHCAP) of the Swiss Agency for Development and Cooperation (SDC) in partnership with the Department of Science and Technology (DST), Government of India and G. B. Pant Institute of Himalayan Environment and Development (GBPIHED). The Chief Guest Shri Alemtemshi Jamir, Former Chief Secretary, Nagaland speaking during the inaugural. (Left to right): Prof. R.M. Pant, Director, NIRD & PR-NERC; Dr. P.P. Dhyani, Director, GBPIHED; and Dr. Shirish Sinha, Deputy Director of Cooperation, SDC.